Last week, president Barack Obama visited South and Central America in a trip that included Brazil, Chile and El Salvador. The trip was the first trip of Obama to the region since elected and he traveled accompanied by his wife Michelle Obama, his two daughters and his mother-in-law. For Brazil, the country with the biggest African descendant population outside of Africa, the visit of the first U.S. Black president should have been of great importance, but it turned out to be a bit dissapointing. Brazilian newly elected president Dilma Rousseff –a former communist guerrilla who was tortured and incarcerated by a U.S. supported military regime in the 1970s- was disappointed in the lack of support from the U.S. for her country’s bid to get a permanent seat on the UN Security Council. To make things worst, while in Brazil, Obama ordered the military attack on Libya, which Brazil strongly opposed. Rouseff also critized the U.S. economic protectionism to its industries and production, while it imposes “free trade” deals to Latin American countries, like Peru and Chile, and now intends to do with Colombia and Panama. The presidents and first ladies of the U.S. and Chile, at La Moneda, the infamous presidential palace, where Chilean president Salvador Allende was assasinated by a U.S. supported military coup. Photo by the Chile government. In Chile, president Obama first acknowledged the presence of the president of the Inter-American Development Bank (IDB), Luis Alberto Moreno, and of Alicia Bárcena, executive secretary of the U.N. Economic Commission for Latin America (ECLA), and the Caribbean. When a U.S. president starts a speech in Latin America, thanking the heads of the main economic agencies for that region, we probably know what he is there for. Read the original text posted by the White House here. U.S. historian and columnist Greg Grandin wrote an excellent article for The Nation referring to this trip, including some information about the history of the mostly-shameful U.S.-Chile relations. Grandin teaches history at NYU and is a member of the American Academy of Arts and Sciences. His most recent book, Fordlandia, was a finalist for the Pulitzer Prize in history. At a time when people around the world are reaching for their freedoms, Chile shows that, yes, it is possible to transition from dictatorship to democracy — and to do so peacefully. Indeed, our marvelous surroundings today, just steps from where Chile lost its democracy decades ago, is a testament to Chile’s progress and its undying democratic spirit. This was a shameful lie. The Chile State is racist from its chore: the Chilean Constitution doesn’t even recognize the existence of Indigenous peoples even though 1.5 million or about 8% of the population acknowledges being Mapuche natives, and 45% of Chileans are mixed Natives with European and other origins. Chile also has Quechua, Aymara and Atacama indigenous communities in the northern regions. Today there are violent conflicts in the southern regions, where the Mapuche peoples are fighting against the take-over of their lands by private corporations supported by the government. Some activists have been killed and imprisoned, including teenagers as young as 14 years old. The conflicts of Chile with the Mapuche peoples started in the XVI century with the creation of the Chile colony by Hispanic invaders. It ended in 1641 with the Mapuche victory. With the creation of the State of Chile in 1810, new trends of European migrants were promoted by the Santiago government “to purify the blood”. The displacement and genocidal of Mapuches was carried out this time by the Chilean army with British, German, Croatian and other immigrants. The Mapuche nation was defeated in 1885. Since 1979, the Mapuche fell victim to an “Indigenous Peoples Law” instituted by the military regime of Augusto Pinochet, whose strongest ally was the U.S. The bloody Pinochet dictatorship was a result of the U.S. scheme titled Plan Condor, which installed several right-wing dictatorships in the Americas. This law, racist as it could be, had the intention of destroying the traditional communities of the Mapuche, and displacing them to give space to private corporations. By the end of 2009, I met the Mapuche historian and leader Víctor M. Gavilán Pinto at the OAS – Organization of the American States in Washington, DC, and we talked about the human rights of his community. Watch video (in Spanish). Gavilan told me that the Constitution of Chile doesn’t recognize the existence of its Indigenous population, that about 1.5 million Mapuches live in Chile, and their communities are facing the militarization of their lands, after the process of criminalization of the protest led by the government of Michelle Bachelet. 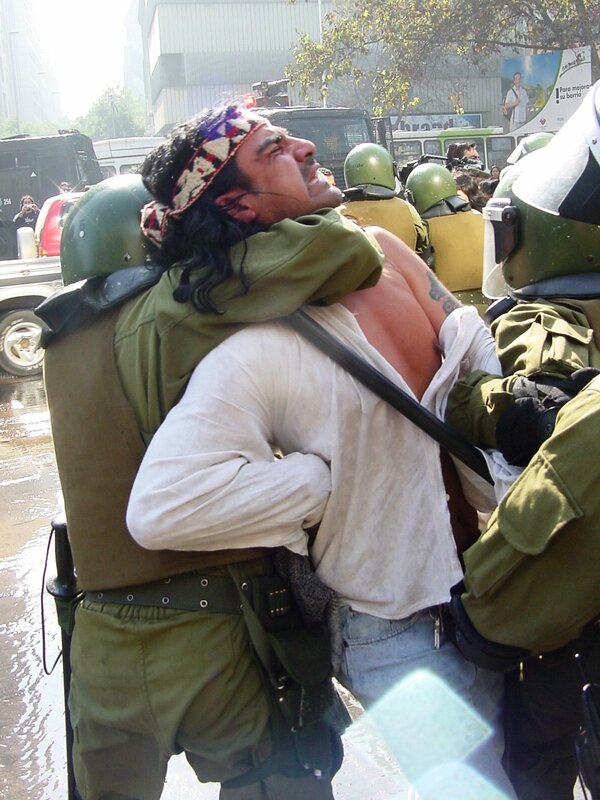 By december 2009 there were 40 Mapuche activists imprisoned, including elder women and spiritual leaders. Last year, several Mapuche leaders started a hunger strike demanding the respect of the human rights of their communities. But the “leftist” president Michelle Bachelet responded with police repression. The new president Sebastian Piniera is using a “anti-terrorist” legislation to justify the torture, incarceration and repression of Mapuches. In 2010, there were several acts of displacement, worsened with the victory of right-wing businessman Sebastian Pinera as president, who called the Mapuches “criminals” and has used the anti-terrorist laws to justify military repression, incarceration and human rights abuses on the Mapuche. As a result, several indigenous leaders in Chile started a hunger strike while in prison, which lasted about 90 days. This civil disobedience act was completely ignored by the media and press in Chile. During the protests, there were about 5 people killed mostly young activists between 17-25 years old. This video shows the police brutal repression of a protest of relatives and friends of the incarcerated Mapuche leaders, occurred in southern Chile, by August 7th, by 2010. A few days after, August 12th, there was a protest in Washington, DC at the Embassy of Chile to the U.S. in solidarity with the Mapuche. I recorded this video. By August 5th, 2010 thirty three miners were trapped in a copper mine in central Chile, and they were rescued 69 days later. This historical event was covered by all Chilean media, and got plenty of international coverage, especially from the U.S. In his speech, president Obama talked extensively about the “33 miners” and praised the people and government of Pinera. During the extensive coverage of Chile by the international media, no one talked about the Mapuche struggle, again. But the abuses continued. I will read the following speech on behalf of Chief Juana Calfunao, she has suffered emotional imbalance, resulting from the torture she suffered and large bruises on her whole body, including the long separation from her daughter Relmutray Cadin Calfunao. 2. Because of my support of the rights of my people and my land, I am persecuted by police and have been arrested countless times; in 2002 I suffered the loss of my unborn baby as a result of the vicious beatings I had endured at the hands of Chilean police . In December 2005 I was arrested in front of my youngest child Relmutray Cadin Calfunao only 8 years of age, I had my hands and feet tied and they stripped me naked and then urinated on my body and my face, the most humiliating experience for a woman. 3. There have been several lawsuits issued to various civil and criminal courts, however they have never been heard neither has there been any investigation into the crimes perpetrated against me. 4. The Chilean courts have taken pictures of past public events, censored in such a way that it appears to the world that I attacked a public prosecutor during my own court hearing, whilst being convicted under a arbitrary law by virtue of the fact that i am a female and also a leader of my people, such has been the product of Chilean State xenophobia. 5. As a result of this type of xenophobic persecution my home has been burned three times by the forces of repression, to date there has been no investigation nor have the perpetrators of these crimes been discovered and brought to justice. 6. In the face of this painful situation that I live day by day, the cost has been immense, there remains a significant fracture of my family, especially in the case of my youngest daughter Relmutray’s situation, as she was forced to seek asylum in Switzerland at the age of 10 years old, where she has since been greatly affected by Western culture and has serious health consequences for which she currently remains hospitalized, this serious deterioration has caused irreparable damage to my daughter, family and to me personally as a mother. The world ignores widely the tragedy happening to the Mapuche in Chile, very few are paying attention. The government of Chile is a racist government, praised by the U.S. government. Somehow, in Greece people care. There was a protest in solidarity this week, as a group of Greek protesters occupied the Chilean consulate in Athens in support of “jailed hunger strikers”. The protest was in support of 14 Mapuche hunger strikers in Chile. Rene Perez, of the U.S. band Calle 13, performs with the words in Spanish “Be strong Mapuche” written on his back during the Vina del Mar Festival Chile, on Feb. 23, 2011. Perez was initially prevented from performing wearing a t-shirt in solidarity with the Mapuche. Photo AP. Although the United Nations has proclaimed 2011 as the International Year for People of African descent, recently two videos have been shared through social network that show some cases of racism in Latin American countries. The first one comes from Chile, where an [Afro] Ecuadorian citizen was arrested by the police. They handcuffed him and [placed chuckles] in his feet just because he crossed the street when the light was red, triggering the outrage of many people since the very moment that it happened. User Tornecino2010 uploaded the video to YouTube. The United States continues to support countries where human rights abuses are committed, as long as become its allies. Chile is the stronger supporter of U.S. policies and economic interests in South America, after Colombia, totally opposed to the rest of the region. Only Peru has joined this isolated trend, and well, Obama praised Peru twice in his Santiago speech, even though that Andean country is facing an increasing social discontent, and where leftist nationalist Ollanta Humala is the favorite to win the presidential elections, next week. According to Michael Froman, Obama’s national security adviser for international economic affairs, “This trip fundamentally is about the US recovery, US exports and the critical relationship that Latin America plays in our economic future and jobs here in the United States.” It’s a startlingly honest admission that, unable to overcome domestic obstacles (that is, the cult of austerity that enthralls Republicans and Democrats alike) to investment and stimulus, the United States is looking abroad for relief. Obama is making the case that more globalized trade—including the pending Colombian Free Trade Agreement—will pull the United States out of its slump. In the past, trade with Latin America did inordinately benefit the United States in all sorts of ways, underwriting its cold war Keynesian and post–cold war neoliberal economies. Today, though, things are different and it’s unlikely that more “free trade” with Latin America would heal what ails the United States. In a future post, I will write about the second part of the unfortunate Obama speech in Santiago. The current president of the United States has proven to be a box full of surprises, most of them are very disappointing so far, including his ability to lie openly so eloquently. The negative image of Obama contrast with the splendid beauty and class that Michelle Obama projects everywhere she goes. These days, find me in my blog Peruanista, where I am reporting on the historical presidential elections in Peru, which the U.S. media is widely ignoring, perhaps because they know Peru might get a needed change of political power, not the kind that the White House praised in Chile, precisely. This is so sad too hear, Im glad im taking Latin American history because I wouldn’t know nothing of this and thats so sad! And people need too come together too get the action needed too cease this cruelty!